We are all about the hot weather right now, but our skin is desperate for soothing and smoothing skincare. Here’s some hot-weather skin solutions for those beauty emergencies after a day at the beach says Trudi Brewer. Once your skin is sunburn or dry it needs some serious TLC. We asked Tatum Dunster from Pure Fiji to give us her best emergency skin tips after the effects of a UV overload. Tatum Dunster from Pure Fiji in Auckland. It may be the sunscreen you have been slathering on your skin. Switch to an oil-free sunscreen and switch to fruit enzyme-laden cleanser. Always cleanse your skin before, and after being out and about in the sun to make sure you have removed residue sunscreen from your skin, this will help to reduce the likelihood of breakout. Pure Fiji Purifying Cleanser, $45. It comes with the territory when you are out in the sun. Often sunscreen will not stick to the nose, and that is because the T-zone is much oilier than the rest of the face. Instead of applying one thick coat of SPF, aim for thin layers and reapply it every two hours layering a BB cream over the top. Keep your skin hydrated at the beach, a skin mist spritz onto your face and body works wonders to help soothe redness and cool the skin under the sun. Pure Fiji Hydrating Body Mist, $30. It's tempting, but don't pick at it. Pulling off shedding skin can cause even more damage. Allow the skin to shed naturally, forget picking at the peeling and focus your energy on healing the skin - fast. Apply lots of after sun with soothing calming ingredients, and a few days later plenty of moisturiser. When you rehydrate the new skin under the peeling, it prevents itching and stops the brown spots and freckles from appearing. Pure Fiji Dilo Rescue Body Gel, $40. Use a gritty scrub that will exfoliate and moisturise at the same time. Glycolic peels also work wonders to remove tan lines (fake or from the sun). And while the tan is fading, blend the uneven colour using a matte bronzing powder. Pure Fiji Coconut Sugar Rub, 67. Coconut oil is the best skin healer thanks to the antibacterial, anti-fungal, and antimicrobial properties it possesses. It will also help soothe your skin if it's itchy after a day on the sand and calms any skin flare-ups you may have from sunburn or cracked dry skin. 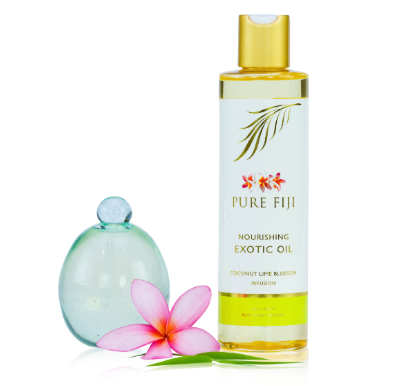 Pure Fiji Coconut Lime Blossom Exotic Bath & Body Oil, $46. Biting bugs and the beach go hand in hand, and without overdosing on chemicals that can cause skin irritation, choose a natural option. Lemongrass oil is not only an excellent remedy for muscle aches and pains, or soothing the digestive system, it kills bacteria on the skin, and it’s brilliant at repelling insects. 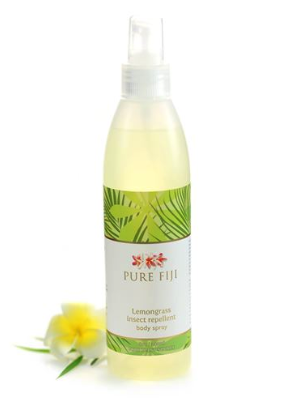 Pure Fiji Lemongrass Insect Repellent Body Spray, $48.